For fans of space science, the New Horizons probe that did a fly-by of Pluto and its moons in July was the highlight of the year. 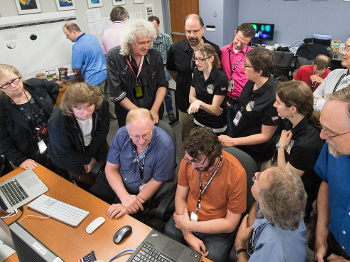 Lots of different scientists and engineers from several agencies came together to make the mission happen, and that included Brian May from Queen—not only a musician but an astrophysicist. That same month, Dr. May came by the Applied Physics Lab (APL) at Johns Hopkins University and assembled some photos of Pluto sent by the probe. One member of the team that spent several weeks at APL for the fly-by is Dr. Joel Parker, a New Horizons co-investigator at the Southwest Research Institute. Speaking via email, Dr. Parker revealed that he also works with Dr. May on the European Space Agency’s Rosetta mission images. When the Rosetta mission team landed the Philae probe on a comet last year, the metal music press picked up that Rosetta project scientist Dr. Matt Taylor was a death metal and grindcore fan. In June, Dr. Taylor won a Spirit of Hammer award at the Metal Hammer Golden Gods ceremony in London, and it was presented to him by none other than Dr. May. That part of the event is below. Indeed, a large number of New Horizons team members, including Dr. Parker and particularly senior scientists, ops, and management, listen to Queen, he said—they spent a lot of time listening to the band in their youth. Dr. Parker added Pink Floyd, Led Zeppelin, Yes, and Jethro Tull to his playlist. That is the area of expertise Dr. May brought to his work at APL in July. And NASA posted that it’s possible he’ll contribute more to the mission in the future as a science collaborator. Awesome. NASA posted space sounds for download. Photos: NASA/Joel Kowsky; NASA/JHUAPL/SwRI/Henry Throop (above). This entry was posted in Interviews, Science + Music and tagged Brian May, ESA, nasa, Queen, Rosetta, space by Editor. Bookmark the permalink.